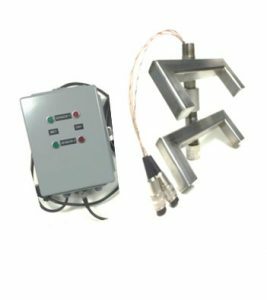 HT1630 Ultrasonic Point Level System - HiTECH Technologies, Inc.
Ultrasonic Point Level System 163 Series is an ideal solution for detecting when sludge in clarifiers or tanks is at a desired level. Maintaining the proper level of sludge contributes to improved plant efficiency and effluent quality by providing for automatic sludge withdrawal for a controllable time period so that sludge of a desired density is delivered to the digester or thickener and preventing the carryover of solids into the effluent system. Constructed in 316LSS material. The electronic module is captured in a plastic cassette and is mounted in a NEMA 4/ 7 explosion proof housing. An LED indicator on the electronic module offers a visual status of the system. Field selectable Relay Fail Safe option is standard. A Demand Push button self-test feature on the electronic module assures the user the system is functioning correctly. The sensor’s construction provides the flexibility of using one sensor for a single point or a number of sensors to detect the sludge at various levels. cable Up to 50” available.